Regional planning translates the provisions derived from the state development programme and the state development plans into the regional plan. They shall be more concrete in spatial terms as this is possible for state planning at its scale level, however, without encroaching on the municipal planning authority of the municipalities. Apart from the integrated regional plan regional planning may establish, in particular, partial plans for the use of wind power and of near-surface raw materials. All public planning bodies and any person of private law according to § 4 sub-par. 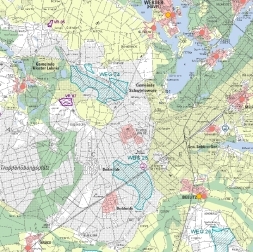 3 of ROG (Raumordnungsgesetz – Regional Planning Act) have to take the objectives of regional planning being bindingly stipulated in the regional plans into account. The state planning authority directs and controls regional planning. This includes, among other things, the promulgation of guidelines for preparing, continuing, modifying and supplementing regional plans and the approval of regional plans. The regions run, at spatial-sectoral level, from the inner up to the outer state border of Brandenburg (map). The Regional Planning Associations have been the supporting organisations in the Brandenburg state. The administrative districts and, possibly, autonomous municipality authorities within the region are members thereof. The regional assembly is the decision-taking body of the Regional Planning Association (RPG-Regionale Planungsgemeinschaft). It consists of a maximum of 40 regional counsellors; apart from the county commissioners and the mayors of the autonomous municipality authorities, also the mayors of municipalities with more than 10,000 inhabitants (“born regional counsellors”) are members of this body due to the power invested in their office. The regional board performs the duties assigned by the regional assembly. The Regional Planning Offices (RPS – Regionale Plannungsstellen) act as branches of the planning associations. They prepare the regional plans and present them for the purpose of decision-taken by the bodies of the regional planning associations. Apart from its compulsory duties, regional planning also sparks incentives for regional development, for instance in the region of Lausitz-Spreewald, by organising the International Building Exhibition Fürst-Pückler-Land.